Cursos impartidos y organizados siguiendo las directrices del programa SSI. It is the first step before you start the Open Water Diver course. During this training, you will learn the basics of diving. You will learn how to use the equipment for your first immersion. You will learn how to breathe underwater and you will experience the lack of gravity. Altogether a fascinating experience! The Try Scuba or Try Scuba Diving SSI program is your introduction to the underwater world. This entry-level program gives you the opportunity to experience the underwater world, whether in confined water or open water, without committing to a longer certification program. You will receive a recognition qualification such as Try Scuba or Try Scuba Diving SSI. The best and unique dive school for you try dive! One day course: approximately 3 hours.Always small groups. An instructor will teach you how to use your equipment, how to breathe underwater, how to move underwater, the basic communication signals. Afterwards, we will provide you with the necessary equipment and bring you to the beach to carry out your first dive, under the supervision of an instructor and a maximum depth of 12m. After an unforgettable experience, you will be brought to the centre where you can shower and change. No heart, respiratory or ear problems. No pregnancy. Don´t fly for at least 12 hours afterwards. Minimum 8 years old always with parents or guardian´s permission. All material, diving insurance and civil responsibility during the activity. Bath suit, towel and shower sandals. This is the basic training which will allow you to dive independently as well as learning the fundamentals of diving in order to be able to plan and enjoy your own immersions safely. This globally-recognized certification program is the best way to begin your life-long adventure as a certified scuba diver. Personalized training is combined with in-water practice sessions to ensure you have the skills and experience required to become truly comfortable underwater. You will earn the SSI Open Water Diver certification. 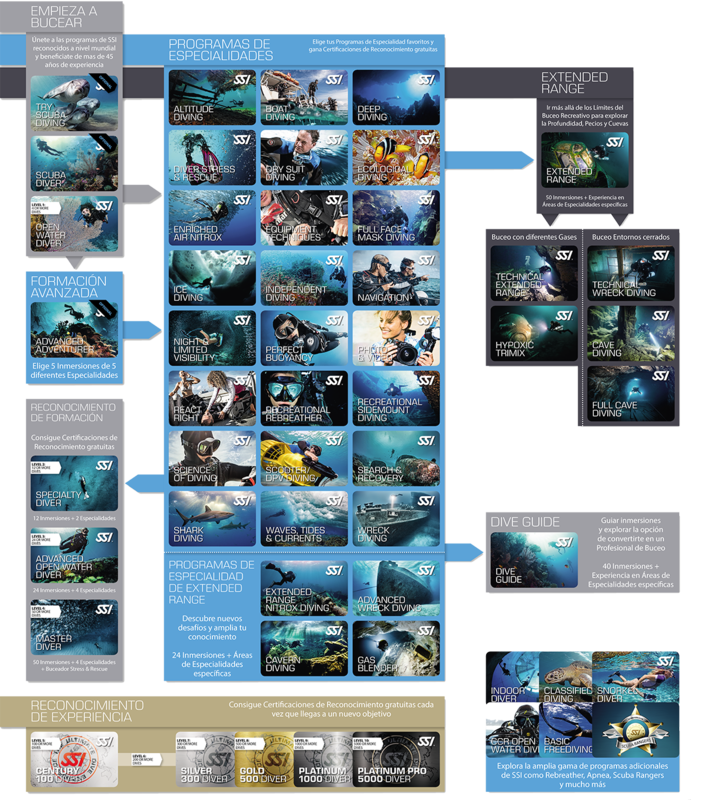 Official SSI title which is internationally recognised (valid for diving worldwide). This permit allows you to dive up to 18 metres and 25m in Catalonia. 6 modules of theory with exams. 5 practical modules in a swimming pool. 5 immersions in the open sea to Mar Menuda. Minimum 10 years old always with parents or guardians permission. Open Water Diver Junior for 10-15 years old. Medical certificate which specifies permission to dive (obtained or renewed in the last 24 months). All diving equipment for the course. Diving insurance and civil responsibility during the training. This program allows you to experience five different open water dives from five SSI Specialties programs without the need to complete the entire Specialty program. If you are not sure of your next step, this is the perfect way to increase your diving skills and experience, and to identify which Specialty program interests you. You will receive the SSI Advanced Adventurer certification after completing this program. Advanced Open Water Diver from 405€, if you want to know the differences between the Advanced Adventurer and the Advanced Open Water Diver, contact us, for a little more, format more completely. Officially recognized SSI official qualification (valid for diving worldwide) that allows you to dive with a partner up to a maximum depth of 30 m.
The course takes 2-3 days / approx 20 hours. 5 immersions, 2 mandatory specialities: deep dive, underwater orientation, night dive, buoyancy, identify species or search and retrieve. SSI Open Water Diver certificate or equivalent. Minimum 15 years old. If older than 12, you may obtain the SSI Advanced Junior which allows you to dive up to 21 metres. Compass (underwater orientation), torch and chemical light (night dive). All of the diving equipment to complete the course. This is the preparation to deal with an emergency. This training will provide you with the skills needed to face medical emergencies not only in relation to diving but in any situation. You will learn how to deal with the most common emergency situations as well as Cardio Pulmonary Resuscitation (CPR) techniques. Emergency First Response is internationally recognised. You will learn all the skills required to proceed with the next level: Rescue Diver. The course takes 1 – 2 days. There are no prerequisites for the Emergency First Response course. Tuition material containing manual and DVD. Support material for medical emergency simulations. The objectives of this training: develop your sense of responsibility to yourself and your fellow divers; develop your aptitude to observe other divers; learn how to act efficiently in emergency and evacuation cases. PADI Rescue Diver title which is internationally recognised (valid for diving worldwide). The course takes 2-4 days / approx 25 hours. 5 modules of theory with video support. 3 practical sessions in the sea with 12 exercises, including 4 emergency simulations. 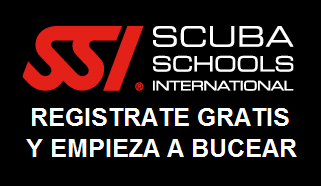 SSI Advanced Diver certificate or equivalent. First aid Emergency First Response certificate or equivalent (obtained or renewed in the last 24 months). This training is the beginning of the professional career recreational diving. It will allow you to work closely with a SSI instructor in order to improve your diving skills and gain professional knowledge. Also, you’ll learn how to organise and supervise students. Are you looking to take the first step to work in diving as a career? Your adventure in the professional levels of recreational diving begins with the SSI Divemaster program. Working closely with an SSI Instructor, in this program you will expand your knowledge of diving and polish your techniques to the professional level. SSI Divemaster training develops your leadership skills, and qualifies you to supervise diving activities and assist instructors with diving students. The SSI Divemaster is the prerequisite for the SSI Assistant Instructor and SSI Open Water Scuba Instructor certifications. SSI Rescue diver certificate or equivalent. Emergency First Response First aid certificate or equivalent (obtained or renewed in the last 24 months). Minimum of 20 certified dives and 60 dives to certify the Divemaster course. SSI didactic kit for study: recreational diving encyclopedia, Workbook (knowledge workbook), wheel version immersion planner, course manual and DVD. Practical experience in introductory courses and the possibility of working in our diving centre. Diving with nitrox enriched air allows you to safely increase your time underwater beyond the decompression limits applied with normal air. Diving with enriched air means more time underwater without security stops. As a diver with enriched air, you are permitted to load your tank with enriched air. Learn how to analyse the air in the tank. Know how to plan dives using enriched air by using the diving tables and computers. SSI Open Water Diver or Junior Open Water certificate ( or equivalent from another organisation). SSI tuition kit which includes book, DVD and nitrox tables. Do you have a question? Do you need more information?